Fodder King (FK) offers the expertise to use treated wastewater to irrigate fodder plantations, increasing the reliability of water supply and providing a buffer against potential water shortages. FK has the engineering knowledge, experience and capability to put treated wastewater to productive use. Wastewater can be treated and used productively, thus turning an environmental problem into a community benefit. FK uses treated wastewater to irrigate fodder plantations, which then become an integral part of the wastewater treatment process. Also known as the enviro-crop, FK’s principal fodder crop, lucerne absorbs nutrients, reduces salinity, produces plant-available nitrogen and sequesters greenhouse gases at a rate rivalling that of trees. 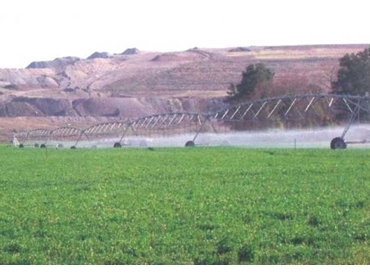 FK’s irrigated lucerne plantations can also provide a sustainable economic solution for treated wastewater from municipal, industrial, mining or energy project sources. FK is offering its expertise to some of Australia’s prominent resources and energy companies on how best to treat and develop a productive use for their wastewater. FK’s know-how can help them reduce capital and operating costs, risks, time and regulatory delays for their new projects. A number of water utilities are also exploring the option of FK establishing irrigated fodder plantations to utilise their treated wastewater, which can then be harvested and marketed by FK.